A gentle touch to the soul. Reflexology is a type of physical massage therapy where certain pressure points on the body are targeted to relieve pain, stress, and tension. Not only is the practice used for physical healing but also for increasing spiritual and mental well-being. When Letter 13 Creative was given the chance to work with a company that provides such a beneficial service we jumped at the opportunity. 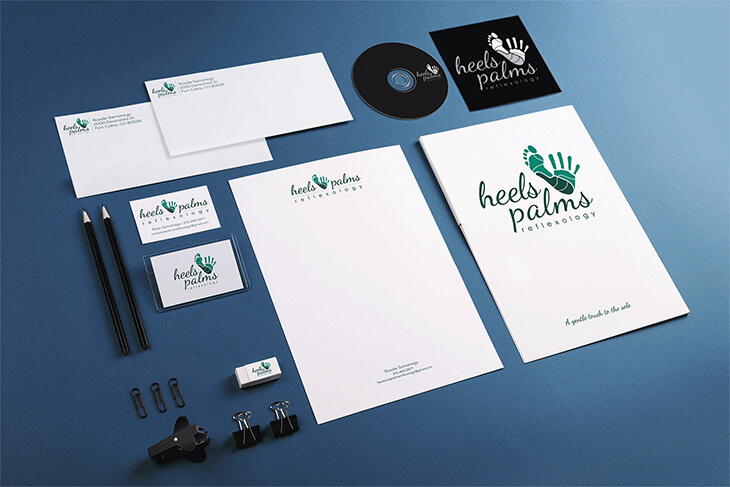 To truly set Heels & Palms Reflexology apart Letter 13 Creative developed this brand and logo project. By digging into their business's core we were able develop the ideas and concepts that not only drive the visuals, but drive their brand and how they interact with customers. The lines in the hand and foot are abstractions of the hand and foot maps used by reflexologists to pinpoint specific areas of the body. Combining these two elements creates balance, and reflexology emphasizes finding the balance between the body and spirit. The main typeface was chosen for its natural movement and hand-made feel, bringing a calming and inviting sense to the design. The colors illustrate the organic and spiritual nature of reflexology, and are intended to relieve stress of viewers.